The height of the king is 9.5 cm. The additional queen. With an enhanced weighting King's height is 9 cm. The height of the pawn is 5 cm. The diameter of the base is 3 cm. Tournament chess. Wooden chess pieces of the Staunton standard. The height of the king is 90 mm. Delivered with a wooden box for the figures and without it. In Poland. The cost is indicated when you buy in Moscow. Check the price of the shipment when ordering. Tournament chess. Wooden chess pieces of the Staunton standard. The height of the king is 96 mm. Supplied with a wooden box for the figures and without it. Pr-in Poland. The cost is indicated when you buy in Moscow. Check the shipping cost when ordering. 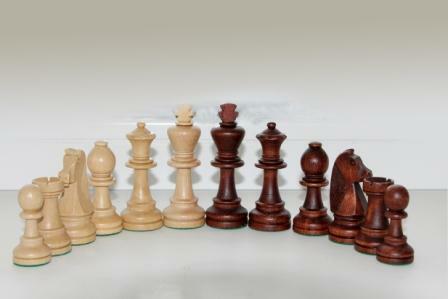 Chess figures from solid wood (maple) with metal weighting inside. Classical Stauntonian figures. Not lacquered (not glare). The bases of the figures are covered with green cloth. Pawn height & ndash; 5.5 cm, King & ndash; 10.0 cm. The drug for the growth of eyelashes Kareprost The cost is indicated when you buy in Moscow. order. Plastic chess DGT with weighting agent. The height of the king is 88 mm, the diameter of the base of the king is 36 mm. Currently used in tournaments of the Central House of chess players. Plastic chess with weighting "Dubrovnik 1950"
King Height & nbsp; 93 mm, king diameter 37 mm. Kit, specially designed for the IX World Chess Olympiad in Dubrovnik, 1950. Later, Bobby Fischer liked this kit very much, you can often see him in the photo behind such figures. In one of the radio interviews, Fisher admitted: “These are the best pieces I have ever had to play. They are amazing! & Quot ;. He wanted to play his second match with Spassky in 1992 with just such a set. In contrast to classic wooden chess, our website presents chess made of plastic. The height of the king is 9.7 cm. The diameter of the king is 3, 8 cm.